Good morning to all of you totally terrific third grade teachers! 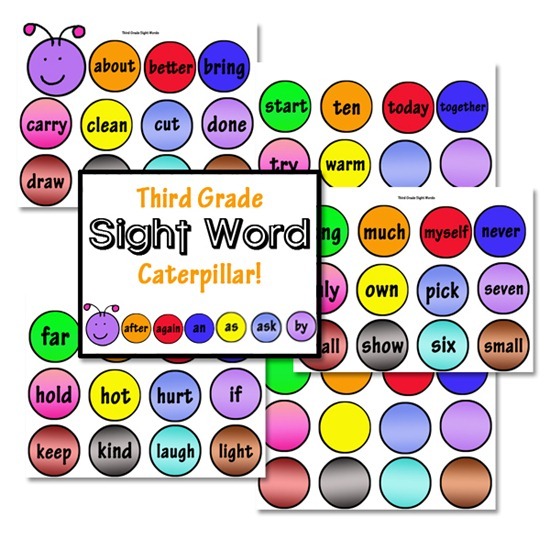 As promised last week, today I’m sharing some very cute and fun Third Grade Sight Word Caterpillar cards with you! Print pages 3-6 on cardstock and laminate for durability if you choose. Page 7 includes blank caterpillar pieces so you can add your own words! TIP: Laminate two sheets back to back so the printed sides are facing out, and the blank sides are touching. Run both sheets through your lamination machine, then cut apart and cut out circles. This will create a circle that is laminated on one side, but not on the back side. This helps with creating a backside that is not slippery and can be taped to the wall. Add the caterpillar head to a blank area of your wall where you plan to add the caterpillar sight word cards. Add each new caterpillar sight word body part to your wall as you learn it. Review your caterpillar cards daily! Third Grade Sight Word Caterpillar. May I have permission to share some of your resources with my students if I indicate I found it on your site? you’re welcome to use my free printables with your students. If you choose to use a paid curriculum, I just ask that you purchase the ‘classroom’ version to use in a school class. I’m a student at norwayne elementary. I’m a third grader. I am visiting this website because I found it on one of my worksheets. Is there any online activities on this website? Do you have 3rd grade sight word sentences to go with the caterpillar? Thank you for the free sight word printables, Erica!! You have an awesome blog that inspires me so much!